Like well-kept secrets, some of the most affecting and proficient artists are only enjoyed by a core group of admirers. 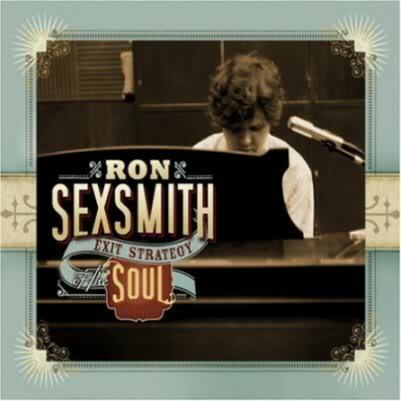 One such artist, Canadian singer/songwriter Ron Sexsmith, has released a steady stream of solid albums for nearly twenty years, yet his audience has remained of relatively modest size. Such is certainly no slight to his abilities, though, as his music accentuates the quality and sensibilities of a gifted tunesmith. If you’re unfamiliar with his work, he melds the lyrical phrasing of folk with structural elements of pop; his voice sounds solemn and soulful, uncannily reminiscent of Boz Scaggs circa Slow Dancer and Silk Degrees. On his latest album, Exit Strategy of the Soul, Sexsmith offers an endearing batch of songs that underscore a wellspring of emotional depth and craft. He demonstrates a compelling knack for melody as well as melancholy, singing of isolation (“Traveling Alone”), fading idealism (“Impossible World”) and forthright despair (“Hard Time”) with unashamed vulnerability and a heavy heart. Rather than coming off as maudlin or wallowing, though, the songs are compassionate, poignant, and even uplifting. New to his sonic repertoire is the inflection here of Cuban horns, which gorgeously embellish tracks like “This Is How I Know” and “Brighter Still” without distracting from the overall productions. And steeped in brass and lush backing vocals, he summons a standout performance on “Brandy Alexander,” co-written with and first recorded by Feist on her 2007 album, The Reminder. Whereas Feist delivered it in a stark and snappy style, Sexsmith insulates the song with a thicker, more-rhythmic mood. Two instrumentals bookend the album, beginning with “Spiritude,” a brief fugue of delicate instrumentation and impressionistic vocal shadowing. “Dawn Anna” ultimately draws the album’s tone and sentiments together in a mournful, evocative coda. On Exit Strategy of the Soul, Ron Sexsmith renders aspects and perceptions of human fragility with empathy and sophistication. And while he may not draw the mass audience his talent deserves, his songs — certainly on this album — are well worth appreciating.